Beyond Imagination: No Longer an Outsider! In June, I had the privilege of flying to Madang province, where the Ogea people live, as a guest at their dedication celebration for the translation of the New Testament into Ogea. I was serving as a photographer and journalist, recording this momentous occasion for them and their children. What a joy it was to celebrate with them this long journey and the fruit of their perseverance! 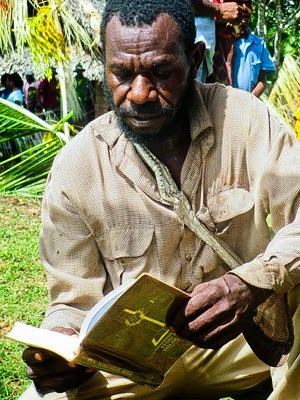 May God bless the Ogea people, and may they continue to know Him more through His Word! The crowd of nearly 500 people shouted and laughed in agreement. Today was a special day—today they were dedicating the translation of the New Testament into the Ogea language! The journey of translation had started almost 40 years earlier when Michael Colburn and his wife joined the Ogea people of Madang Province as translation advisors in 1977, a role that continued until publication of the New Testament. Kelebai was the primary translator, but died shortly after he had drafted the entire New Testament. Don and Marib then took over the translation program and brought the translation through the checking stages and to completion for dedication in June 2014. Although many trials faced the translators, God continued to reach Ogea people with the Scriptures. After hearing the Gospel of Mark, Mrs. Sigou Ura committed to following Christ. Soon afterward, when she and her husband planted their garden, their primary source of food, they took a bold stand. They chose to rely on the God of the Bible rather than perform the traditional rites that would appeal to the local spirits for blessing. When harvest came, their garden produced more than enough food for their family! As Sigou shared the abundance with other families, she told them it was the God of the Bible who had blessed her garden, not the spirits. At the dedication, church leaders encouraged the people not only to use their newly translated Bibles but also to share God’s truth with the surrounding languages. Choirs, dance groups, and drama teams performed, sharing their excitement for the translation and demonstrating the hope that it would spread throughout the language community. 56 Bibles were sold, and Scripture was read aloud publicly for the first time by Marib: John 1:1 “In the beginning was the Word…and the Word became flesh and dwelled among us”—and now His Word was among the Ogea too!